In a small, mud-walled workshop on a winding street in the labyrinth of Tashkent’s Old Town, delicate silk scarves imprinted with bold designs flutter in the air. 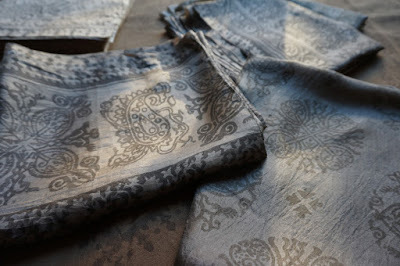 “Seven block-printing stamps were used to make this scarf,” said artisan Yuriy Pak, showing off a gossamer gold silk creation emblazoned with circular designs enclosed in elaborate borders. Casually attired in jeans, a T-shirt and baseball cap, Pak looks like an unlikely ambassador for one of Central Asia’s traditional design techniques. But the 60-year-old craftsman is at the vanguard of efforts to keep the ancient art of block printing alive in Uzbekistan. 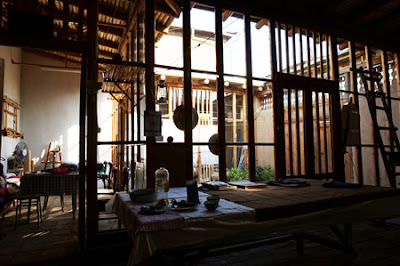 “We decided to revive this form of applied art here,” Pak told EurasiaNet.org with a sweeping gesture taking in the scarves drying from washing lines and spread over tables in his higgledy-piggledy workshop in the shadow of Tashkent’s imposing Hazrat Imam Mosque. A fragment of block-printed fabric reportedly recovered from the Samarkand tomb of Bibi-Khanum, the wife of 14th-century conqueror Tamerlane, is testament to the age-old roots of this art form in the land that is now Uzbekistan. For centuries, chitgarlik – as block printing is called in Uzbek – has been handed down from one generation to the next, with some families boasting genealogical trees of master craftsmen dating back to the 19th century and beyond. These days, the survival of a craft dating back centuries is under threat. Artisans under whom block printing was kept alive during the Soviet era are aging and dying, and the younger generation is often reluctant to uphold the tradition. 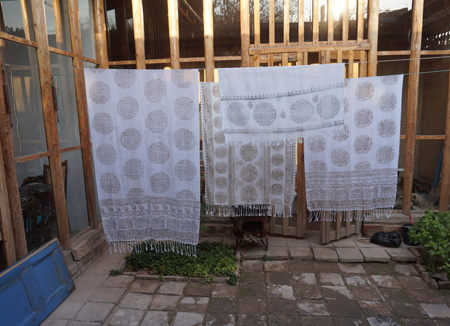 There are now only a handful of craftsmen and women practicing the art of block printing by hand in Uzbekistan, in places like Bukhara and the silk-weaving center of Margilan in the Fergana Valley. Pak is keeping the skill alive in Tashkent, though it was not passed down in his family, which is part of Uzbekistan’s community of ethnic Koreans exiled to Central Asia by Stalin in the 1930s. A one-time artist and textile maker, Pak is a newcomer as a chitgar, or block printer. He developed an interest in the technique and converted his former textile-production workshop in Tashkent’s Old Town into a block-printing operation around three years ago. 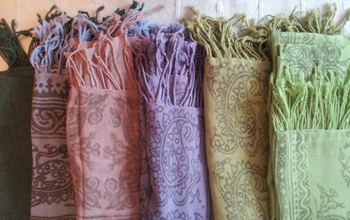 These days, working with two assistants, Pak produces about 1,000 scarves a year, which retail in Uzbekistan for around $25 apiece in boutiques and gift shops. To learn the art of block printing, Pak studied in Margilan under renowned master craftsman Solijon Akhmadaliyev, who coached him in the general techniques. 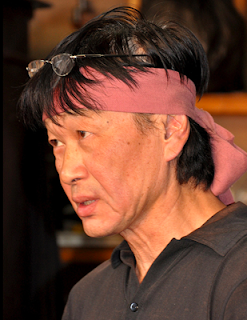 “I had to master the fine points myself,” said Pak. “I had to work at it,” he added, recalling how at first “the dyes would wash away” during the printing process until Pak developed his own tricks of the trade. 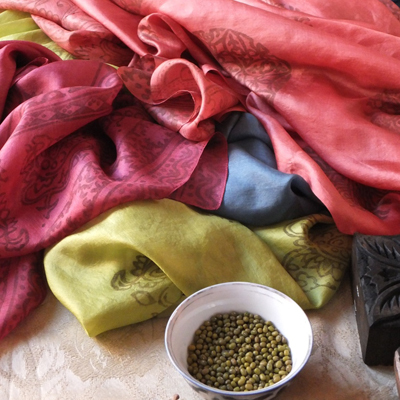 Pak sources his silk from the celebrated Yodgorlik factory in Margilan and dyes it in his workshop using natural ingredients – anything from walnuts and pistachios to berries and onion skins. The dyer adds the natural ingredients to create the desired shade, then leaves the material out drying in the sun for hours. “This is indigo,” said Pak, pointing to a navy scarf drying on a washing line. “And this is walnut,” he added, indicating a gold one shimmering next to it. Pak picked up a brush and slapped some dye onto a carved stamp made of walnut, called a qolib. “Then we stamp the pattern onto the cloth,” he concluded, bringing the qolib down with a flourish and leaving a flowery design imprinted on the silk. “In the old days, a craftsman would ideally have had about a hundred qolib, but I’ve got about forty,” Pak said. Many of the designs are symbolic, such as the pomegranate representing fertility or the circular symbol representing home and hearth. The distinctive thorn shape is habitually used on linings for the chopon, a traditional long robe or coat. Sourcing the stamps is difficult, so Pak has purchased an industrial machine that can produce qolib in his workshop to expand his repertoire. 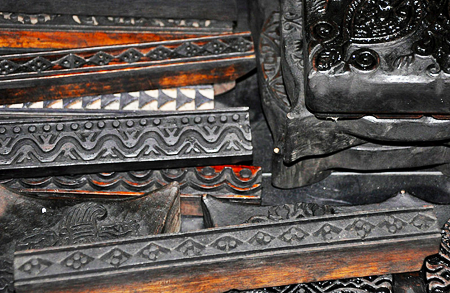 In the old days, block printing was “considered an art form affordable for the lower classes,” Pak said. They would buy block-printed textiles on cheap cloth to decorate their homes because they could not afford the exquisite hand-embroidered suzani textiles favored by the rich as decor. These days, though, chitgarlik is in fashion. Working with Pak, Uzbekistani designer Saida Amir has produced a stylish collection of block-printed outfits featuring flowing dresses and elegant silk jackets. The fresh twist put on this ancient form of design by the fashion industry suggests reports of the demise of block printing in Uzbekistan are definitely premature. Source: This article, written by Joanna Lillis, was originally published by EurasiaNet.org, on 5 January 2016. It is reposted with permission. On Uzbek Journeys tours we visit Mr Pak's studio to watch the woodblock process.